The US Department of Homeland Security (DHS) plans to monitor and create a database of information about hundreds of thousands of global news sources in order to track media coverage of the DHS and identify “top media influencers.” On April 3, DHS released its plan to hire a contractor that will help it track the media and create a database that will hold data on more than 290,000 global news sources and social media in more than 100 languages. Such information will include news outlets’ “sentiment,” geographical spread, and top posters, as well as the “location, beat and type of influencer” for monitored individuals. The DHS contractor will have “24/7 access to a password protected, media influencer database, including journalists, editors, correspondents, social media influencers, bloggers etc.” In a tweet, DHS spokesperson, Tyler Q. Houlton stated: “Despite what some reporters may suggest, this is nothing more than the standard practice of monitoring current events in the media.” Journalists voiced their concerns about the plan’s implications for press freedom, calling it “dangerous.” This plan comes at a time when the US administration has exhibited consistent hostility towards reporters and news outlets. Reporter Manuel Duran was arrested on April 3 in Memphis, Tennessee, while covering a protest led by immigration activists and now faces deportation. He is the second journalist arrested in 2018. Originally from El Salvador, Duran owns online news outlet Memphis Noticias. While he attempted to livestream the protest on his site, the Memphis police arrested Duran and nine protesters on charges of disorderly conduct and “obstruction of a highway or passageway.” During his court hearing on April 5, all charges against Duran were dropped; however, US Immigration and Customs Enforcement (ICE) detained him immediately after the hearing. ICE spokesman Bryan D. Cox said, "Mr. (Duran) was ordered removed from the United States by a federal immigration judge in January 2007 after failing to appear for his scheduled court date. He has been an immigration fugitive since that time." Christina Swatzell, who is representing Duran in the immigration case, has not seen or spoken to Duran since he was detained. Another journalist is currently in ICE detention: Mexican reporter Emilio Gutierrez Soto and his 24-year-old son, Oscar, are being held near El Paso, Texas while awaiting an appeal in their request for asylum. Duran is the second journalist in the US to be arrested so far in 2018, according to the US Press Freedom Tracker. 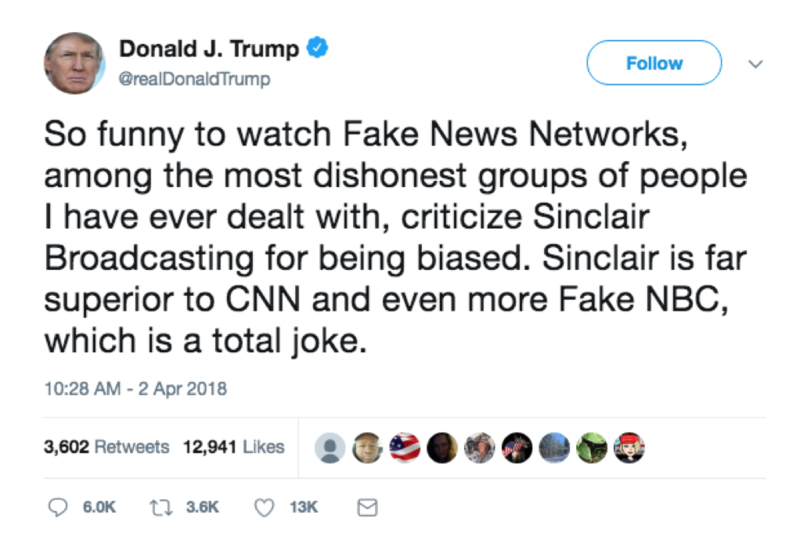 On April 2, President Trump reacted to Sinclair Broadcast Company’s promo controversy by tweeting his support for the company. While at least one Sinclair-owned station has warned their staff not to speak with the press about the promos, some staffers have both publicly and anonymously expressed their disapproval or even resigned from their positions within the company. However, leaked company contracts illustrate the obstacles that have deterred others from leaving their jobs at Sinclair. Sinclair is one of the country’s largest broadcasting companies, owning and operating almost 200 television channels throughout the United States. Brad Parscale, President Trump’s 2020 presidential campaign manager, called for CNN’s Chief White House correspondent Jim Acosta to have his press credentials revoked. Parscale retweeted a video that showed Acosta asking Trump questions regarding DACA during the White House Easter Egg Roll on April 2. 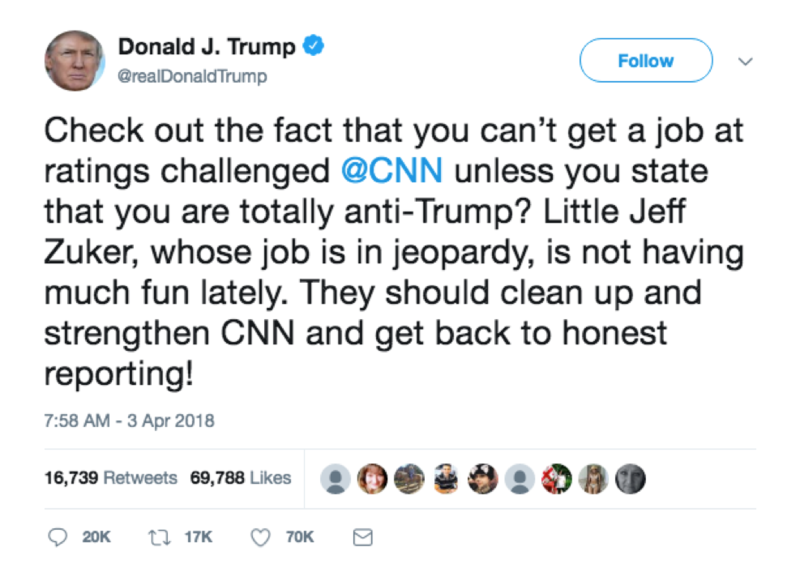 Parscale added to the retweet: “He continues to embarrass himself and @CNN. Pull his credentials for each incident.” Later, Acosta replied to Parscale’s tweet saying, “Just doing my job.. which is protected by the First Amendment of The Constitution. You might want to give it a read.” A similar incident occured in December 2017 when Acosta claimed that White House press secretary Sarah Huckabee-Sanders threatened to ban him from future pool sprays if he attempted to ask President Trump a question during a bill signing. Environmental Protection Agency (EPA) chief Scott Pruitt held an event with "limited press access" on April 3. The EPA tried to restrain the press from attending, only allowing television camera access to Fox News, while neglecting to inform CNN, ABC, NBC, or CBS. Fox then informed the other four networks about the event, which afterwards gained equal access. After Pruitt gave his remarks, he did not take any questions from reporters. Pruitt is currently under pressure over his suspicious spending of public money and ethics violations. Limited press access to governmental events has been a common trend under the current administration. Last month, members of the press were barred access to a school visit with Education Secretary Betsy DeVos. President Trump mocked the American press during a joint press conference with Latvian President Raimonds Vējonis on April 3, using his usual anti-media rhetoric. He told the Latvian president to “Pick a reporter, please. A Baltic reporter ideally. Real news, not fake news.” Trump himself took only one question from a US reporter, selecting to answer a majority of questions from foreign reporters. President Trump has only held three press conferences since he won the Republican nomination in July 2016. Most of the press conferences that he does hold are with other political leaders.